What is new in Angle 4? Specifying the detector data is a crucial part of efficiency calculations. In Angle you can define an unlimited number of detectors of any type the software supports (see further). You can enter parameters for all detectors in your lab and use them, without any limitations. All your detectors will be displayed in an alphabetically sorted list. 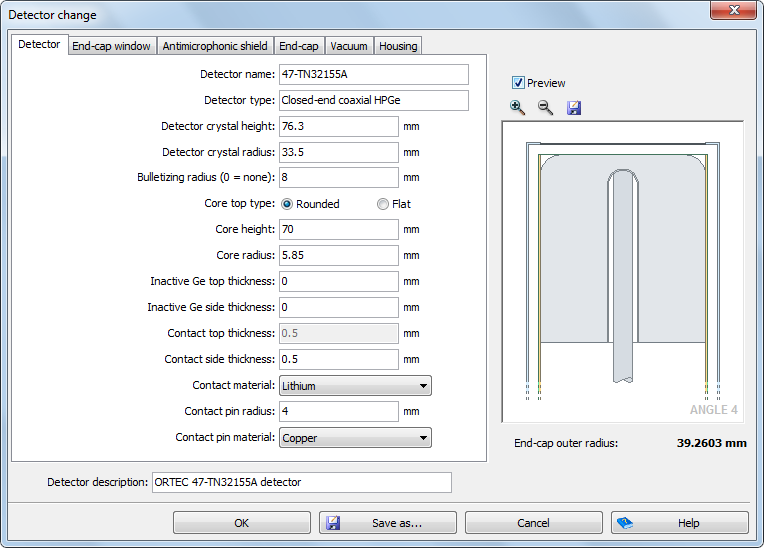 Demo detectors are a new feature of Angle 4 – it now comes with a set of eight predefined demo detectors, one for each supported type. The demo detectors can be used for calculations even in demo mode, that is, even if Angle is not yet registered. This enables users to run calculations and evaluate the results, so as to become more familiar with the scope of the software and its capabilities without/before being registered. Demo detectors are also very useful for educational/training purposes. Now Angle is there for everyone as a free educational/training tool. For example, it can be used for studying the impact of particular parameters characterizing the detection process on the detection efficiency; or, just to experience/train or gamma-spectrometry practice. Demo detectors are read-only, so their parameters cannot be altered, but you are able to delete them. Once deleted, it is not possible to restore a demo detector back to the list, and you will lose the possibility of using that detector again in the future. Be careful if you are using an unregistered version of Angle, since you will lose the calculation possibilities for any deleted demo detector. 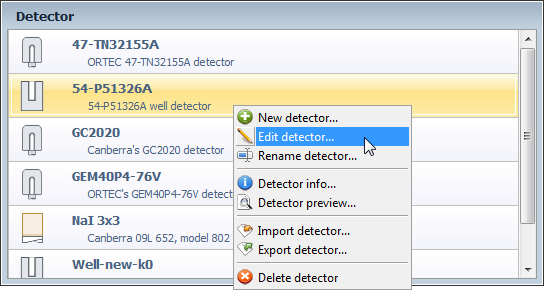 The options for detector manipulation are located in the “Detector” tab on the ribbon. The alternative way is to use the pop-up menu with the same options, which you can open by right-clicking the list of detectors. 1This group does not exist for well type detectors (not applicable, or being irrelevant for efficiency calculations). The next figure shows the detector data entry window, with the preview image on the right-hand side and a red dimension line indicating the parameter being edited (detector radius). Above the illustration you can find a “Preview” combo box. You can check it to see the scaled preview, instead of the generic illustration. The image is proportional, which is useful for noticing any made blunders in parameter entries, which would otherwise be hard to detect. Although useful and practical, “Preview” functionality is not aimed and does not explicitly detect all input errors! You can zoom-in and zoom-out the preview image, pan it and export it to various raster and vector graphics formats (read more in Data entry section). To be able to see the preview image, all dimensions must be entered. Otherwise, the preview cannot be generated. 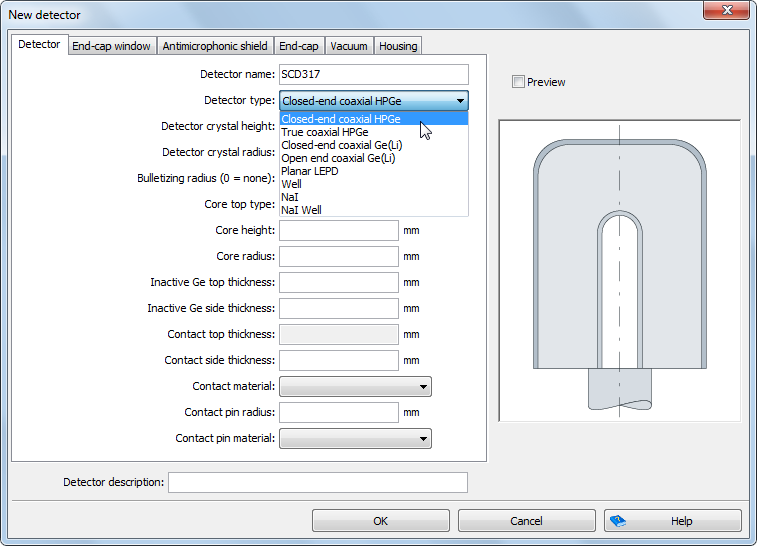 If you check the end-cap window or antimicrophonic shield options, additional tab(s) will be displayed, as well as the additional fields, so their dimensions and materials can be specified. 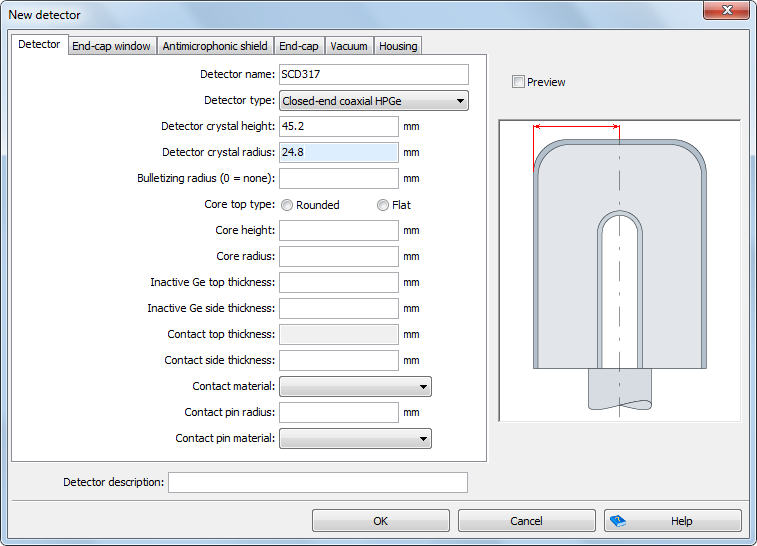 Depending on whether the antimicrophonic shield exists or not, the number of fields needed to be entered under the Vacuum tab will be different. If your detector’s end-cap is coated with some material(s), you can define up to two coating layers. Each coating layer can be of a different material and its thicknesses can be defined separately for end-cap top and side. Once all parameters are defined, Angle will calculate and display the detector end-cap outer radius. You can use this value to re-check if you entered the data correctly. This is a well-known parameter (also easily measurable), while in Angle it is obtained as the sum of several separate (inner) detector parameters.